As an object moves through the air, the air resists the motion of the object. This resistance is called aerodynamic drag. Drag is present on all objects moving through the air from airliners to baseballs. Drag is the component of the aerodynamic force that is aligned and opposite to the flight direction. On this page we will discuss some of the details of the drag on a baseball. where rho is the air density , V is the velocity, b is the radius of the ball, and mu is the air viscosity. If the value of the Reynolds number is very low (~100), the viscous forces dominate the inertial forces and thick laminar boundary layers are formed on the surface of the object. If the Reynolds number is very large (~ 10^7), the inertial forces dominate the viscous forces and the boundary layer is thin. 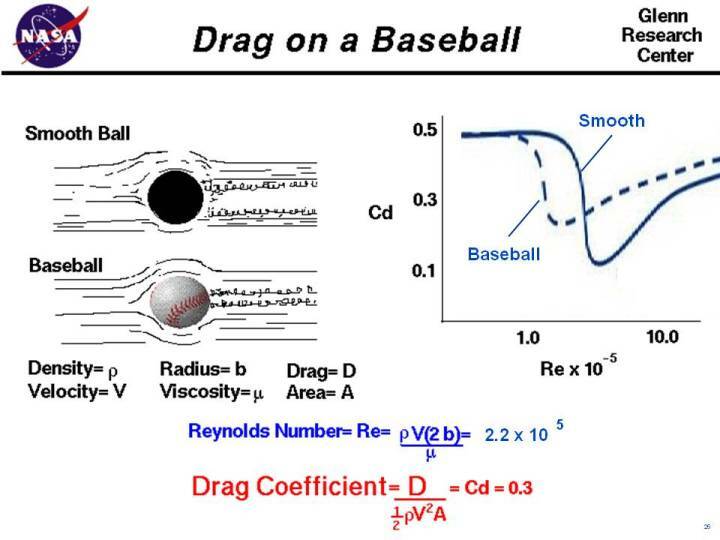 where D is the drag, A is the cross-sectional area, and cd is the drag coefficient a number that represents all of the complex factors affecting drag. Drag coefficients for a specific object are determined experimentally using a model in a wind tunnel. For flow past a ball, determining the drag coefficient gets a little more confusing. The drag on a ball is being generated by the boundary layer separating from the back of the ball. As the flow separates, it creates a viscous wake behind the ball. A large, wide wake generates a large amount of drag; a thin wake produces less drag. The thickness of the wake, and the drag on the ball, depends on the conditions in the boundary layer which, as we have seen, depends on the Reynolds number. For the graph on the right of the figure, we show some experimental data for a smooth ball (in blue). The drag coefficient has a high value at low Re values, then drops down to a lower value from which it continues to increase with increasing Re. The interpretation of the curve is that, at lower Re values, the boundary layer is laminar and the wake is thick. As Re increases, the boundary layer transitions to turbulent, which initially produces a thinner wake, but with increasing speed and Re, the wake thickens and the drag increases. This is the value of drag coefficient that is used in the HitModeler and the CruveBall Expert simulation programs.